If there’s one thing I’m adverse to neglecting, it’s a bargain. Both of these beauties were bargains, and looking at my collection I realised I actually rarely pay full price for anything – unless it’s an item I think will sell out and then get listed on eBay for twice the price! 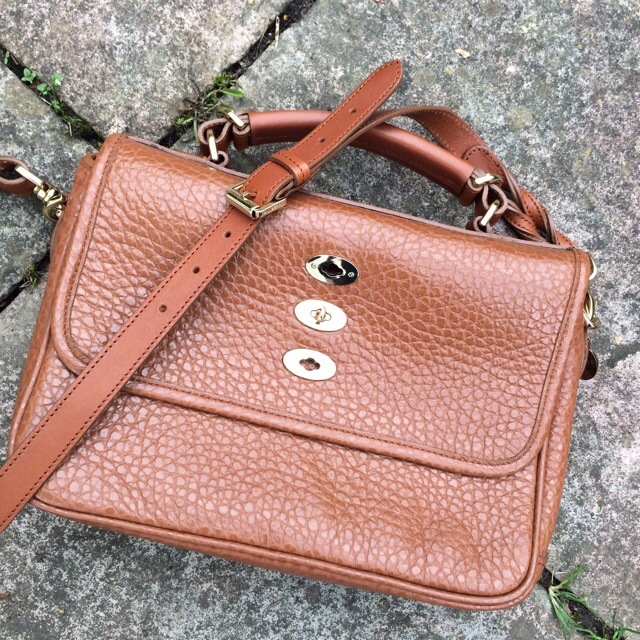 My beautiful Bryn in shiny grain oak was my first ever Mulberry bag, bought in the sale last year as an early birthday present. It’s now no longer in production, which is a shame because I love the triple lock detail on the front! 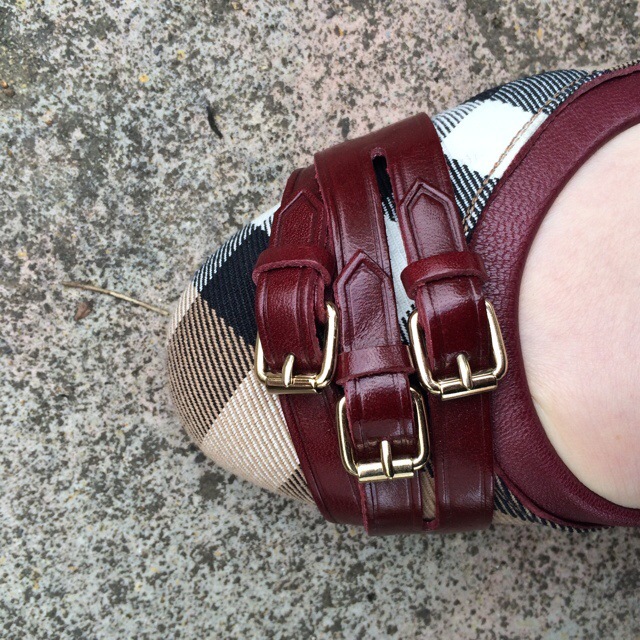 My Burberry flats were purchased at half price from Bicester Village. There’s another triple buckle feature on these too! They’re no longer available in this oxblood colour, but you can buy versions with white or black trim (£235), or similar double buckled ones in black and claret (£250) from Burberry. I’ll be honest, I wasn’t initially convinced by the elasticated sides, as I think they look a little… odd… But the shoe fits comfortably and the sides even out when wearing so it’s not really noticeable. 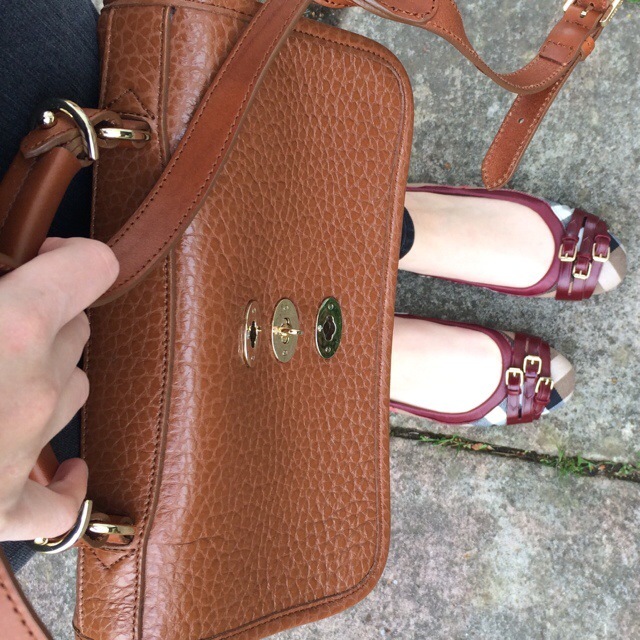 Definitely more of an autumnal combo these, but I couldn’t resist breaking out my Bryn again – I just love satchels! 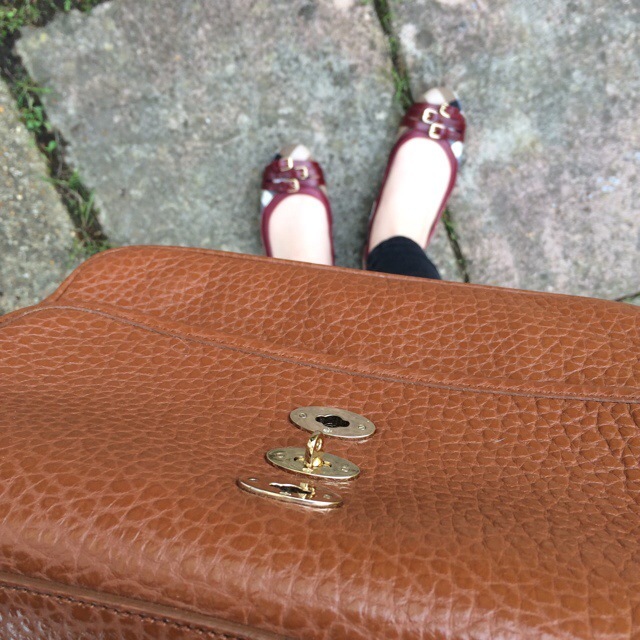 And it’s such a smart bag – although, I’ve found that oak is surprisingly difficult to match to shoes, which is weird. I don’t like matching block colours of black and brown together, although I do really love them mixed together as an animal print! 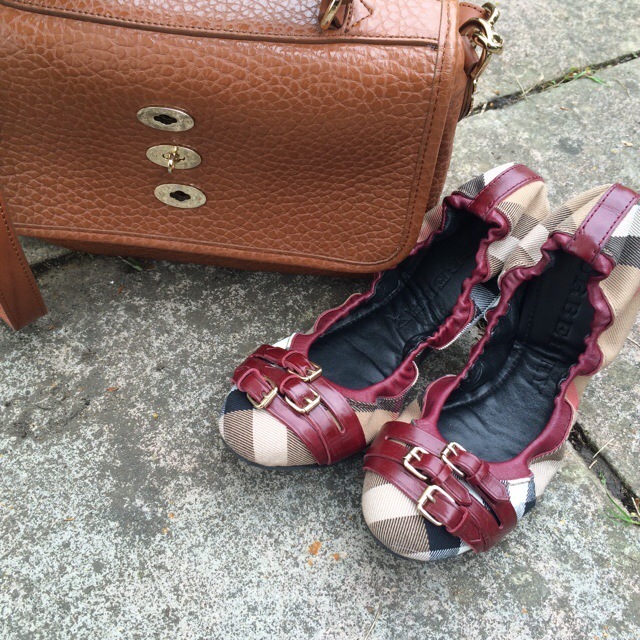 Purchase similar Burberry flats here. 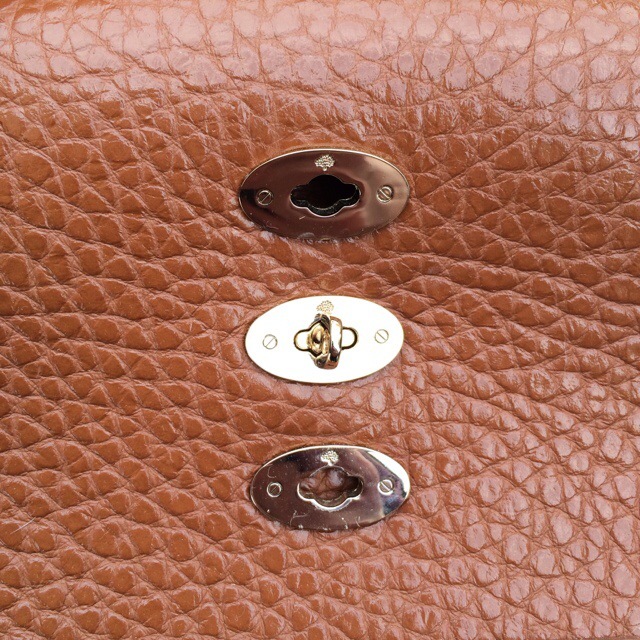 Find Mulberry’s current collection of oak bags here. 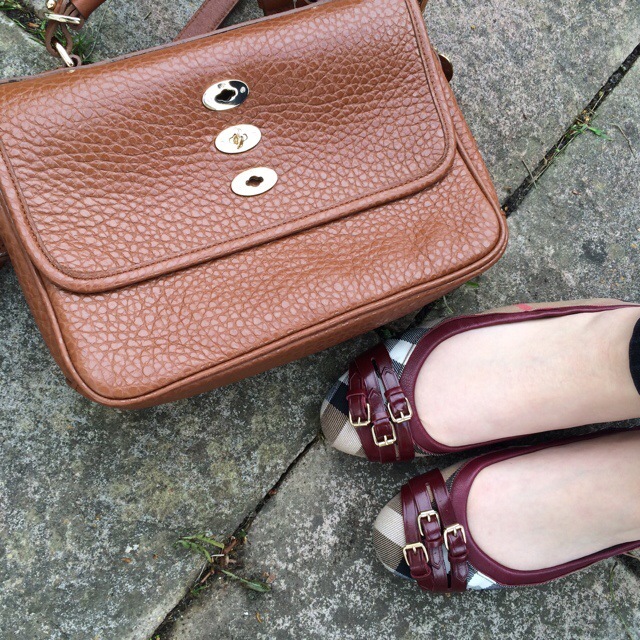 Mulberry Pointed Flats And Me: Together At Last!